A fresh, cooling summer dish featuring watermelon’s savory side. 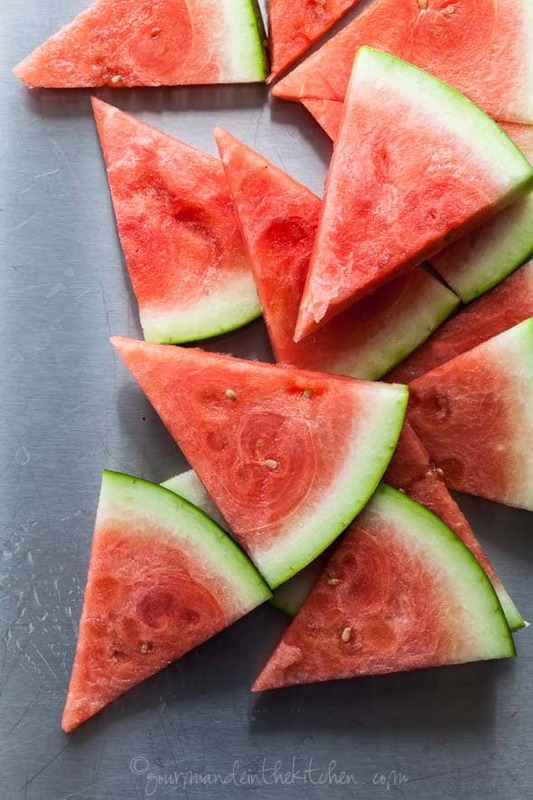 Wonderfully cool and crunchy, watermelon is truly the perfect summer food. Refreshingly delicious, it keeps you hydrated while offering a good dose of potassium and lycopene. 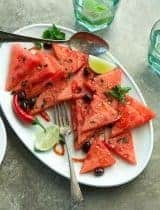 And while biting into a freshly cut slice on a hot day is one of those simple summer pleasures, it’s also equally tasty paired with more savory flavors, making it a multitasking kind of fruit. 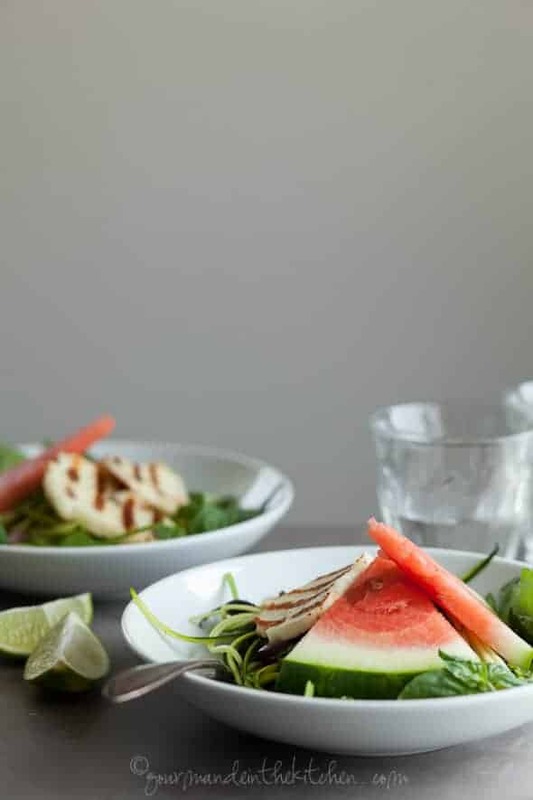 Combine sweet watermelon, with fresh baby spinach, slippery zucchini noodles and the freshness of mint and basil and you’ve got the makings of a dish that’s a welcome addition to any summer menu. 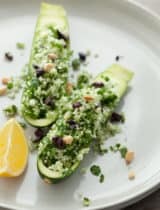 It’s tough to think of a better dinner on a warm evening, and this is just the kind of dish I want to dig into at a picnic or barbeque. This dish relies on fresh ingredients that deliver big flavors when married together in the simplest of fashion. You start with a base of tender baby spinach, topped with tender zucchini noodles slicked with bits of black olives and chopped basil. 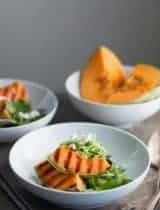 Triangles of juicy watermelon are next in line as is a sprinkling of fresh mint. The final flourish are warm slice of grilled halloumi cheese and a pinch of sea salt to tie it all together. 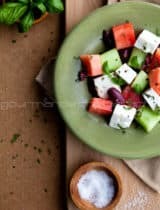 Saltly black olives and Halloumi cheese bring out the sweetness in the watermelon, amplifying its flavor, while the lime vinaigrette provides acidity and liveliness and the herbs a fresh counterpoint to both the salty and sweet flavors. It’s quick and casual and just the kind of thing you’ll find yourself craving on a hot day. How do you like to eat watermelon? Everything good about summer in a bowl. Whisk together the lime juice, 3 Tablespoons of the olive oil, salt, and pepper. Set aside while you make the halloumi cheese. Preheat a grill or set your oven to broil. Lightly brush the cheese slices with 1 Tablespoon of the olive oil. And place on grill or broiler pan. Cook flipping once until bubbly and golden (about 1 minute per side). Place the spinach in a large bowl and toss with half of the dressing. 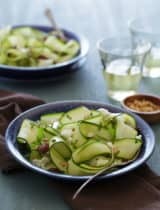 In another bowl, toss the zucchini noodles with the other half of the dressing along with the olives and chopped basil. 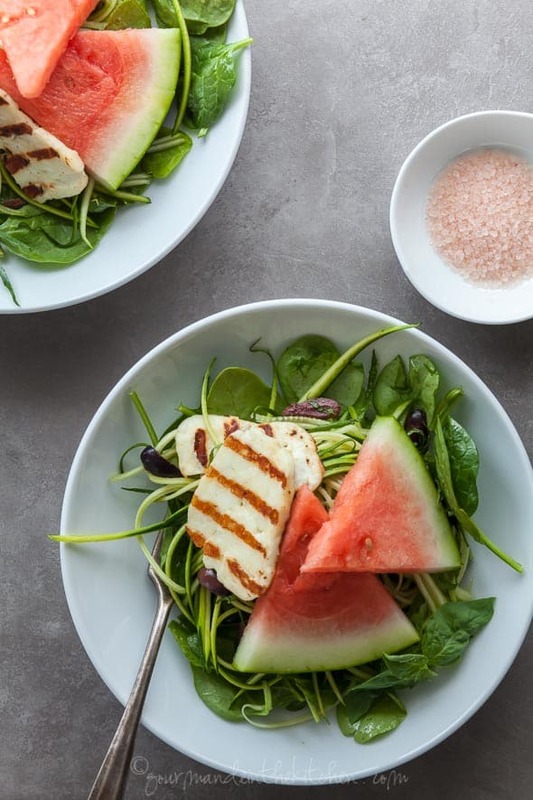 Place spinach on a plate or shallow bowl, top with zucchini noodles, watermelon slices, a few slices of the grilled halloumi and sprinkle with a few mint leaves. Taste for seasoning (adding a pinch of salt or a drizzle of olive oil if necessary) and serve immediately. Pairing the cheese, watermelon, spinach, zoodles, olives and lime is such a great idea! 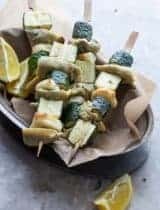 So refreshing and such a delightful variation of flavors in each forkful! How have I never thought to put watermelon in a salad?! This just blew my taste buds! 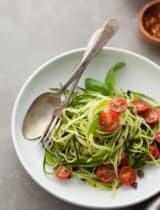 I adore zucchini noodles, so I am definitely going to get my healthy, summer salad on! Pinned! Oh yum! I love the idea of watermelon in a salad. I think I just fell in love with a salad. So beautiful, friend. You always have the most beautiful recipes! It's like a summer picnic in a bowl! Lovely idea! Watermelon any and all ways! What a wonderful summer salad! I love how you showcase such fresh flavors in this salad. I can imagine how refreshing it would be on a sunny day. Beautiful colors too! Such a pretty and refreshing salad! I love adding watermelon to salads--so fresh and just tastes like summer. This one looks great. What a great combination! I would have never thought to pair up watermelon this way! But it looks delicious! 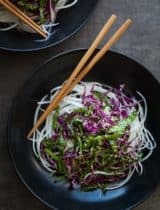 I have julienne peeler but I do hope to buy a spiralizer one day... it looks much easier to make zucchini noodle salad! So fresh and refreshing salad! I love the combination of watermelon and zucchini in here that I haven't explored yet. Thanks for the inspiration and recipe, Sylvie! What an interesting combination of flavors and how perfect for the summer! Woman, you're a machine. Like summer on a plate! This salad looks so stunning and delicious! Absolutely loving grilled cheese! Super healthy and super YUM! Your pairings for this dish are really great. This is so refreshing and would really be enjoyed during summer. The color looks perfect and everything is just so fresh! I love it!